ProMax has earned the ‘Premium CRM’ designation from General Motors as part of our participation in GM DTAP (Dealer Technology Assistance Program) Data Service integration. GM Dealers who utilize a Premium CRM not only have access to great DTAP features, but they’re also eligible to take advantage of the GM iMR Turnkey Vendor Program matching funds. The GM Dealer Customer Data Exchange (DCDE) Customer Search capability from within ProMax provides you accurate and up to date customer contact information as well as repair order history. Get a more complete view of your customer's history with enhanced data from GM, all available from the Customer Workscreen in ProMax, and the Mobile Workscreen in ProMax Mobile. GM DTAP Vehicle Pricing Service (VPS) information is fully integrated into ProMax and Promax Mobile. 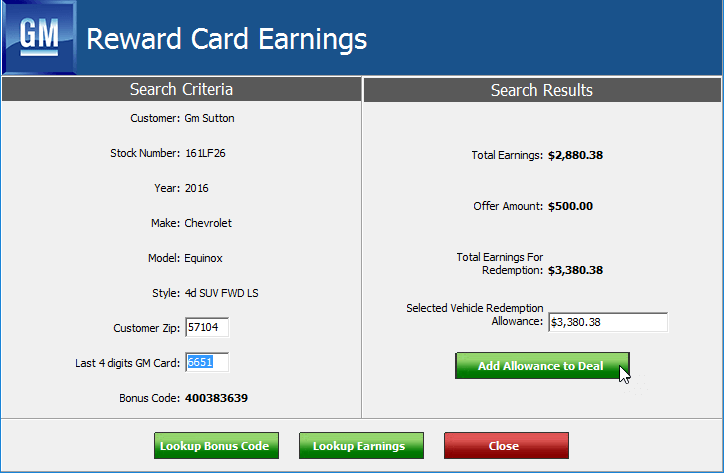 You can access a customer's current GM Rewards Card earnings from the Customer Workscreen, the ProMax Mobile Workscreen, or any applicable Desking F&I screen. Look up a customer’s earnings and incorporate the Vehicle Redemption Allowance into the deal, all with a few easy clicks. Get access to incentive compatibility and stackability information directly from GM from any applicable Desking F&I screen or deal in ProMax. 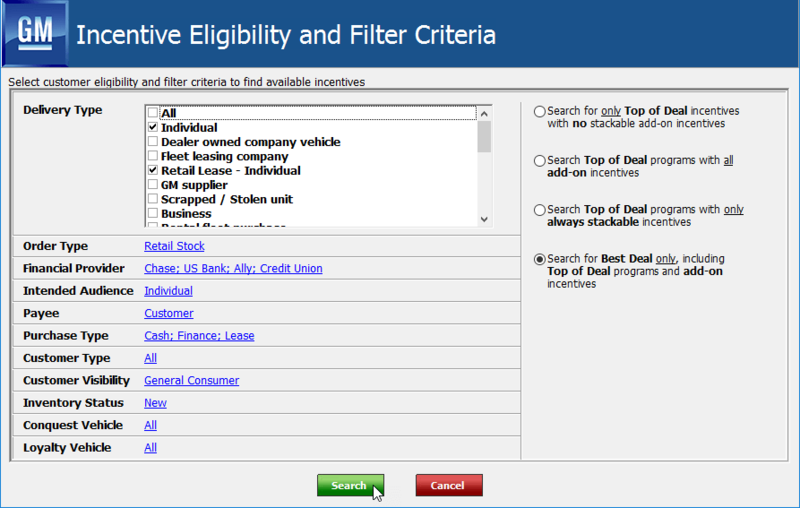 You can view all available programs and details, and multiple targeted search options make it easy to structure the incentives in the best possible way. GM Vehicle Locator Service (VLS) and Vehicle Invoice Service (VIS) enable you to find vehicles, vehicle information, and vehicle invoices with ease, all from within your ProMax system. If you're looking for a certain vehicle at another dealership, or more GM-specific details about your own inventory, VLS will help you find it. You can search by VIN, Stock #, or Year Make Model Style, and you can narrow results with custom search filters for nearly every possible variable. From the search results you can view reports, compare vehicles, and break down all the available options. Hover over any field on the results page for additional information. Vehicle Invoice Service (VIS) goes a step further and enables you to view the invoice and full production record of every vehicle.